Monday, November 12th, 2018 at 3:00pm. For the 24th year in a row, the Marine Industries Association of Palm Beach County (MIAPBC) is kicking off the holiday season by hosting the Palm Beach Holiday Boat Parade. 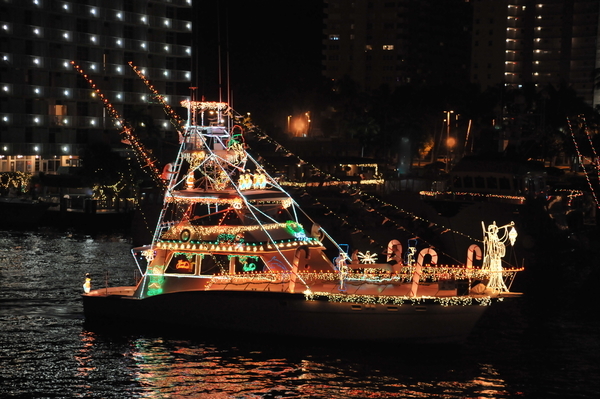 From center consoles to pleasure yachts, dozens of South Florida boats will be decking their hulls in colorful lights and cruising through the intracoastal for a spectacular show of holiday spirit. The parade will be led by a Zambelli Fireworks travelling display, will begin at the north end of Lake Worth Lagoon a 6 pm, and will travel north on the intracoastal to end with a grand finale at the Jupiter Lighthouse around 8pm, courtesy of Jetty’s, Square Grouper, and U-Tiki.